Chickpeas (a.k.a. garbanzo beans) don't grow in cans. Like other peas and beans, they grow in pods on vines. Before they fully ripen and yellow to then get dried and cooked and canned, they are bright green in fresh fuzzy pods like the one above. While still not widely available, they've moved from being something I see only at farmers markets to being an item I sometimes spot at specialty markets and local grocery stores—that's when I know a produce item is gaining in popularity! It's also when lots of people may be encountering an item for the first time and looking for tips on buying and using it. The pods on fresh chickpeas are stiff and fuzzy. Look for pods that are green, without too much browning or wilted edges. If some of the pods have popped open along their edge, that's okay. Those pods protecting fresh, green chickpeas are fuzzy and stiff and not delicious. Take the chickpeas out and discard the pods. 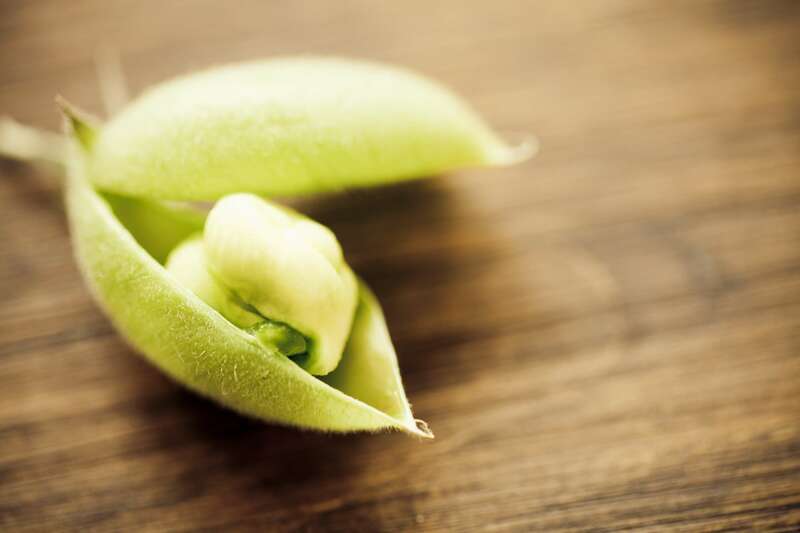 The pods will pop right open with just the teeniest bit of prying—each pod holds just one or two chickpeas, so be warned that the shelling stage can take awhile. The most common way to cook fresh chickpeas is to simply boil them in salted water until they're tender. Bring a pot of salted water to a boil, add the chickpeas, and cook until tender, 3 to 5 minutes depending on how many there are and how fresh they are. Once tender, drain the chickpeas and dunk them in ice cold water or run cold water over them to cool them off quickly and keep them that pretty green color. Serve them with a sprinkle of salt much like edamame or add them to a salad. You can also use fresh chickpeas much as you would green peas or fava beans, as in this Fava Bean Risotto. Fresh chickpeas can also be charred in their pods, salted, and served as a fun, tasty snack. Simply heat a cast iron skillet or similarly heavy cooking vessel over high heat, add the chickpeas in a single layer, and cook until the pods are charred and the peas inside are tender, about 3 minutes. Sprinkle and salt and serve, trying to avoid burning fingers! You can find a more traditional recipe for Pan-Charred Chickpeas here. What Is (and Isn't) Pastured Pork? What's In Season In Montana?